It’s been more than a week since the inauguration and the protest that denied Trump the crowds he craves, and helped reset the media narrative. We’ve got a lot to be proud of in the climate movement, and we’re struggling under the sheer weight of horrible news that’s been dumped on us in an unbelievably short period of time. Tillerson confirmed, Pruitt likely, the Muslim ban, the defections and failure to block cloture by Democrats. But let me direct your attention backwards, for just a moment, to consider what happened on January 20, and some (I think) important lessons it provides about how the Climate movement can and should lead the resistance, and how this project can help. First of all, thanks to all our friends who wrote up great accounts of the day have been written up by some friends. Special kudos to David at OCI and Farhad of the Chorus Foundation (nerd power!) for ones I liked. I won’t recount the whole day and what happened since others have done that well. The climate movement was actually, truly, a really big and important part of what happened. The protest at the “Red Gate” was a really big demonstration (hundreds of people) and was largely effective at the goals we set for ourselves. Planning meetings to support the action and plan strategy more generally were also attended by dozens of people on Wednesday and Thursday night. Numbers aren’t everything, but in the age of mass-resistance, they are an important thing – and we brought some big ones. Part of what made it work was that nobody tried to “own” it. There were a couple of logos and banners for organizations at the Red Gate, but mostly there were just people. The organizers of the event and the trainings that pre-ceded it worked for Oil Change International, 350.org, Stand.earth and half a dozen groups. But none of those organizations tried to control the agenda or speak to the press on behalf of the rally. In fact, I was a little surprised at hoe many groups – even groups that support Direct Action tactics like 350 and Greenpeace – stood back from #DisruptJ20 and decided to fund actions, email their lists about it, or otherwise raise awareness. The positive side of that was that this was clearly an ‘organic’ action – no paid protestors, just a lot of pissed off people some of whom worked or volunteered with specific climate action groups, and some just showing up for the first time. Mass noncooperation and defiance can so change social and political institutions, especially power relationships , that the dictator’ ability to control the economic, social, and political processes of government and the society is taken away. So, what’s this thing, 198 methods, got to do with it? Fundamentally, i think this showed me that an idea like 198-methods can world. A big, climate-lead movement of resistance and disruption can be effective and can happen. I also firmly believe in an intersectional approach to organizing – that means owning, acknowledging, and addressing (where we can) the fact that systems like climate change are racist. We’ll never defeat pollution until we address hate and discrimination (against women, immigrants, you name it) in our culture as well. Just like at the inauguration, our fights are linked. And now we have a clear example of what action together and in solidarity can look like. The part where big green (and event smaller, more radical green groups) stepped back and didn’t (or weren’t able to recruit for this action also showed that there’s a need for this kind of organizing – intersectional, distributed, not leader-less but rather leader-full actions. #DisruptJ20 and the climate blockade didn’t organize themselves. But we might have been the only climate-oriented group that sent an email out to tell you about it- specifically recruiting some 150+ action participants. If #1 shows that we can make these actions work and be meaningful, #2 shows that we’re not duplicating effort. Lots and lots of groups are asking you to call your Senators and oppose confirming key Trump cabinet members – that’s good stuff and we should all be making those calls, attending those town hall meetings, and signing those petitions. But if, like me, you’re not convinced that’s enough to stop Trump or demonstrate real resistance, then 198 methods will give you alternatives and additional actions that DO. Actions like Divestment, boycotts, protests, and civil disobedience/resistance – you know, all the stuff that’s on that 198 methods list written by Gene Sharp. 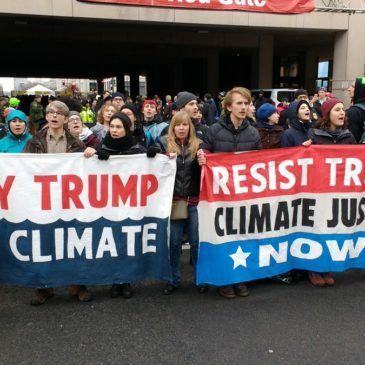 To that’s it – my recollection of the #ClimateJ20 protests at the #DisruptJ20 inauguration protest. And here’s some more excellent photos, video and more from the day. What do you think? Were you at a protest on inauguration day and have a story or opinion to share? Let us know in the comments or hit me on twitter and tell me what you think.